Okay, enough twiddling about -- this marks the finish of the 4th RUSA randonee in as many months - so, officially, that's a "run". 1/3rd of the way to R-12 #2. That makes it enough in the bank to provide motivation to get me through the traditionally tough months of November-February in the KC-Area. Game on. Woke up before my alarm, motivated, ready... ready to race against the sunrise to make sure I had as much time in the bank as possible before the promised NW winds turned the Border Patrol into a death-slog for the return trip. After reading a lot of ultra-racing stories from a recently discovered blog I was mentally stoked with tales of "Scary Gary" and recent Nebraska cross-state records filling my head. I'm not really sure what I expected of myself - but I wasn't going to dawdle much today if I could help it, at least not on the outbound leg. After all - these rides are quickly becoming "training sessions", rather than THE events. More on that later. 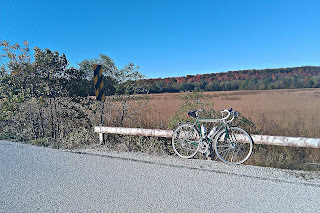 I rose to 57ºF on the thermometer, which isn't bad at all -- but, the northwest wind and the recent dry cold front that came with it created a downright chilly feel to the morning air, colder than last month's ride even with the rain being absent! I ate, showered, and reshuffled my dressing scheme to compensate, figuring that I'd rather be comfortable early on and shed layers later. This was a good move... I wouldn't actually feel motivated to remove the extra layers until I only had 22 miles remaining in the ride! Today was mental -- I knew that the ride wouldn't really start until I was at the halfway point, looking back north. I divided the course in half, and focused only on the first 67 miles that would take me to the turnaround. At 4:01am, I shot back my usual pre-ride 5-Hour Energy, and headed south into the darkness. The moon and Jupiter were paired up overhead, full and bright -- Orion was up also. Jets passing overhead, and powerlines and signposts singing and clanging in the strong winds... which, for now, were helping me along. I settled into a sustainable tempo and proceeded to hold it there - pausing to climb the Col Du Arboretum - for the next 25 miles, arriving at Louisburg at around 5:15am. I took a little break here, as has become habit - refilled the one bottle I drained, a quick snack, and back at it. As I have oft remembered too late, I was happy about my decision to don extra layers here despite the numbers on the thermometer. The big hills south of town and the chilly downhills bottoming out at every creek crossing made it feel much colder than it really was, and I actually felt a mild shiver. I am mentally reaching a good place with relation to distances on the bike -- I can't quite pinpoint the exact mental training I've been undergoing, but I can think about manageable sections of the routes, as well as the whole thing, and have a feeling of calm about it. My hope is that this will translate when up against longer and longer rides next year. Right now, however, my new approach has managed to "shorten" even the long slog of Metcalf from 199th to 359th from "22 freaking miles" to "only 22 miles"... if that makes sense. Perhaps it's exposure, perhaps its just a mental trick -- but it's working well. It's difficult to type this without sounding like I've lost my marbles... but even the Border Patrol route as a whole, now, seems "short". Like I said, it's a good place to be before putting bigger brevets on the calendar - to get back to that point where you can actually be HAPPY when you mumble to yourself "only 100 miles to go..."
Not looking to wear myself out too much, but still trying to get to the halfway and start making tracks north before the strongest winds of the day came on was the primary goal. Metcalf was over-with, and the highway section from 335th to 359th streets was checked off - afterwhich I stopped at the bottom of the exit ramp for a quick nature-break and a snack. Making good time... Mounted back up, and proceeded to chip away at Jingo Road, marveled at the view of La Cygne power generation plant to the east, all lit up, and made it to K-152 in good time. Big downhill... and checked in at La Cygne, KS at 6:52am... not bad... in fact, only 34 minutes shy of "beating the control opening". Compared to brushes with control *closings* in the recent past, that'll do nicely! I thank the tailwind... which, I was quite sure, would take a fair amount of that time back in the coming hours. I would have been even earlier, but apparently the 7:00AM coal train was early today, so I ate part of my hourly rations while waiting for the train to clear the crossing. I love trains, so it wasn't exactly a hardship having to witness a pre-dawn flyby. More food, refills, restroom -- hydration going well -- and back on the bike. Thankfully, the sun was beginning to lighten the sky towards the horizon... a moment where I wished I had a good camera with panoramic ability... the moon and Jupiter were still visible, but the way the light of dawn illuminated the scene was really cool. Serene... Finally, on LN 1095, maybe 10 miles from the halfway point, the sun finally broke above the horizon. Didn't quite make it to the halfway before dawn, but hey --- seeing the sunrise from the road, I'll take it any time. Finally with the sun up, I could SEE things... including the remarkable fall colors of the hillsides surrounding the valley. Reds, oranges, yellows... all afire in the early morning light and crystal clear air, and set against the brown and tan of the surrounding seas of crops. Birds are singing, hawks are out for the morning hunt, an owl is heard, and a flurry of young deer gallop across the roadway only 1/8th of a mile ahead of me. It's an awesome sight.. but I glance off to the right to make sure there isn't a buck gunning for me. Apparently, word is getting out about cyclists and the deer are taking action. At least in Africa they are... maybe the word isn't out stateside yet. I am treated to a "semi gravel" ride this time out, as Linn County seemingly is performing some road maintenance on 1095 lately. In fact, it seems a lot of roads are benefiting from some much-needed maintenance this year, including 175th street closer to home. Down here, however, the highway maintenance program seems more aligned with the "Texas approach", and the result is monster chip seal. It's not the worst I've had - and with 28c tires, who's complaining? - but it was definitely gravel-esqe as a large majority of the aggregate hadn't settled in yet. Interspersed were large sections of completely glassly and rubbery asphalt resurfacing, which was alarmingly smooth by comparison. It was akin to riding in the rain and suddenly passing underneath a bridge or overpass, when the rain suddenly stops, but then picks up again on the other end. Most of 1095 is like this now, but it's not bad riding. ...Made up my mind to make a new start, Going To (Pleasanton-ia) with an achin'... in my heart. Took my chances on a (tourin' frame), never let them tell you that they're all the same. Later, after nearing the top of Paris Hill(ton) and passing the Linnville School site, a dog came tearing out of the woods and crossed the road in front of me, giving me a look that said "fear". What the??? A dog running *from* a cyclist?? That's impossible... The only thing that would make a dog run from a cyclist is if there is something chasing the cyclist... or something back in those woods... IT'S GODZILLA!! More hills...more scenery... a nature break at the Mt. Carmel Cemetery gates, and then Flathead Pass (bonus points if you can figure out how I finally named this hill) reaching over the ridge and then dropping you down some perfect, new pavement as you approach Pleasanton, and the halfway point. 8:27am on the receipt, and comestibles. This year saw the return to more engineered nutrition on the bike. It's a place I'd been before when consistent speed (as opposed to wicked fast racer speed, to be clear here) was more of a motivation for longer rides. With my sights set on at least finishing another 600km brevet in 2012, I figured it was as good a time as any to examine a return to successful fueling strategies. However, fuel on the bike is worthless unless you fuel correctly ALL the time. Huh? A little personal history, I've never been super healthy. I like beer. I like comfort food. I like easy food. I don't cook. I'm also a vegetarian... but I'm probably the worst vegetarian you'll ever meet, in the sense that I'm not eating steamed vegetables and wheat-grass. Where there are "steak and potatoes" folk, I simply just eat more potatoes. With ketchup. Added together, I don't eat well on OR off the bike. I've been doing some homework lately, specifically talking to a personal coach... now, now, now, hold on: I'm not paying for this service. My "service" comes from a friend at work that has competed professionally in the past in another, non-cycling, endeavor that taught her a lot about health, diet and training. I'm taking this as un-cycling biased nutritional consultation. We've discussed goals, methodology, and approach - and since the Monday after the "Mere Two-Hundred" ride, I've been following a fairly structured program that *seems* to be working. Here's a general approach run-down: 85% of most everything is mental... and 15% physical. Of that 15% physical, 85% is DIET, 10% is exercise, and 5% is genetics. So, if you've been making excuses like *I* have, try eating better and see if the results change. Give it a month. To also be clear, this isn't "going on a diet" - this is diet in the strictest sense of "what you eat". While portion control is important, too, this is more about fueling what you do - not about how much or little you should eat. The subject of protein came up. Long story short (too late on THIS blog) I wasn't getting enough. I bounced her information off of several endurance sports publications, and the general consensus was clear: no matter what scientific formula I applied, I was not getting enough protein. Side effects? Lethargy, fatigue, physical over-training issues, no performance gains, etc, etc, etc,... a laundry list of the kinds of issues that have plagued past distance rides. I won't get all weird and preachy about this stuff -- but, I'm no longer going to half-(ahem) my approach to personal goals anymore, either. Speed isn't everything - some of the best times I've had on a bike are when I wasn't worried about speed at all. We've been over this. Clearly though, the challenges I have nutritionally have translated into fatigue and slower progress at the end of long rides time and time again, and my goals haven't changed: therefore, I have to change to meet my goals. Even if I stop riding a bike I still need to treat my body better. Nutrition on the road involved Hammer Perpetuem Solids, Hammer Gel packets, and two Honey Stinger Waffles (yum) that I was testing on this ride. I noticed that I needed something in my gut every 30 minutes... the hunger I was feeling was real. It never cascaded into a bonk, push was consistent - but I was compelled to listen to what my body wanted. As a consequence, I went through my pocket rations faster than I'd wanted to -- but, thankfully, I'd packed more than enough. At the controls, I "behaved" -- tried not to keep my feet on the ground more than 15 minutes a shot. I don't think I took in enough non-pocket food to support the day - something I need to work on when in a hurry. I tried not to just grab random junk food, but that led to not grabbing anything...which isn't good either. Total control-grub ended up being a 1/2 can sized Pringles at Louisburg (when I really began to feel hungry), a single-pack of Fig Newtons and qt. of Gatorade at Pleasanton, and.... uh.... that's it. Crap, I said I wouldn't bore you with this... sorry! After leaving Pleasanton for the run back north, it was apparent almost immediately that the 17+ MPH average I built on the trip down was going to be destroyed in a matter of hours. Passing the last of the trees lining the road leading out of town, I was treated to a full face of wind... and it was only to get stronger. It wasn't even 9:00am yet... I was making good time... step on it. I climbed up the back side of Flathead, made my way along Sugar Creek valley, just keeping my head low and moving my legs up and down. A few more hills, and a brief tailwind section to remind me how much fun I'd been having on the trip south, and I stopped for a quick nature break and photo on a short bridge. Somewhere on Linn CO. 1095 highway... pause. The Border Patrol is a very exposed route... there aren't many trees to block the wind on a day like this, so I decided to lie to myself. "Nice tailwind today..." I actually muttered it aloud, as if it would sink in. "Now you can make some steam..." I tried to keep my cadence up, and enjoy the fruits of my manufactured "tailwind"...and by jove, it worked. At least, it could have gone far worse. I could have convinced myself that it was futility, and geared down... but I didn't. I repeated; hydrate, fuel...pedal. I'm not sure I remember a time where I came off of Jingo Road quite so quickly... unless there was a time warp. After that video, I regretted the waffle... it was tasty, don't get me wrong... but I felt whipped for a bit. Perhaps too much effort? Perhaps it WAS the calories running low... who knows. I still made it back to Louisburg in decent enough time, and paused to remove extra layers as the sun had finally warmed the air enough to my liking to shed them. Packed up, snacked up, and ready... my old pal Metcalf awaited. Why didn't I make this a free-route permanent, again? More brain-unplug riding here, I guess... before I knew it, I was back at 199th street and turning west. The wind was there... but, I just worked through it. Apparently my mental trick is shaping up to be simply this: if I don't want to complain about it, I don't "record" it, either. Pedal. Drink. Eat. Repeat. ...go that way, really fast... if something gets in your way, turn. Antioch... 175th... a short rest at 175th and Murlen, where I just got overwhelmed with "whoa... tired...." and contemplated taking a nature break in front of about 15 houses. I decided against it. Three miles... you can hold it... (ugh). I knew the headwind would take a toll, but I'll take the result - a finishing average of 15.6 MPH, I can live with. 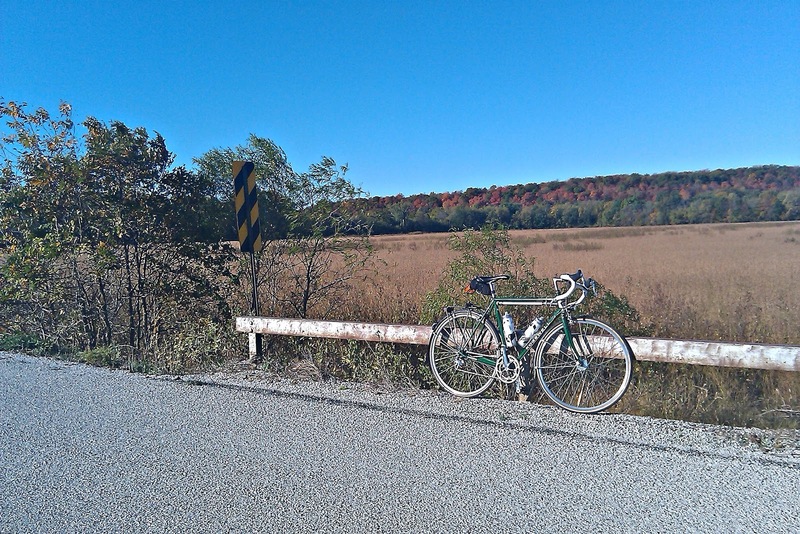 I held it in the 16's until just after Louisburg, but fatigue and that wind simply caught up. I'm very pleased with this one. It felt really good to get out, and despite a minor fit issue (which you are about to read about), I'm feeling pretty dialed-in. Pain? The immediate ride-finish post prior to this one mentioned some pain immediately following the ride. Ever since switching to the new shoes after the last 200km ride, I had a sneaking feeling this would come up. There was a glimmer at the DSR ride, but I elected not to change anything before the big ride. Cut to today, the pain is completely gone - less than 24-hours later - however, the fact that issues were there at all still indicates an issue. If I'd had 200km TO GO at that point, that would have been bad. I set up the bike in the trainer and measurements confirmed the suspicion. Not fresh, but it explained the pains. Today, I feel GREAT. A recovery session on the indoor trainer this AM seems to indicate that the problem is taken care of. We shall see; with slow, easy commutes next week, stretching, and perhaps a 100km tune-up sometime before the NEXT 200km. A lesson that when you change shoes (or ANY equipment), don't assume that you can eyeball it. Set up the bike in the trainer and make sure. I got lazy, basically. The main goal here is just to keep things neutral.... I know I've mentioned this "fit" stuff a lot recently, but it never really comes up until a person rides LONG. For most folks, none of this matters. You can be "off" all over the place and never have a consequence... but slap 300 miles on it, and the millimeters make a difference. Okay, enough of that issue. I haven't been listening to ANY of this stuff... but for some reason it all kept popping into my head, especially Led Zeppelin, which I haven't actively sought out in years. On Linn 1095, right at sunrise, something put all three of these song into my head in succession, and in this order. I don't know what did that, but it happened.